Is there a more appropriate venue to stage a dramatisation of Zadie Smith’s award-winning novel from 2000 “White Teeth” than the recently (rather splendidly) refurbished theatre formerly known as the Tricycle? Given the novel’s unforgettable NW London settings, where the oddly renamed Kil(bur)n Theatre also sits, the answer has to be “No”. An odd amalgam between straight play and musical, I would call it a play with music, Stephen Sharkey’s muscular adaptation of the novel catches its sense of cosmopolitan, multi-cultural London with its quirks and oddities, whilst keeping the darker elements safely stowed away under “Farce”. You can even laugh at (or with) Islamist terrorists, Nazi scientists and unreconstituted racists here. Because ultimately Smith’s novel is a treasury of interwoven stories not a polemic despite the best efforts of some reviewers. The one element of this production which fails to convince is the present-day framing device which is introduced. Whilst this may have provided useful short-cuts for Sharkey in telling the novel’s narrative it inevitably acts in an alienating fashion and detracts from the immediacy of the storytelling . 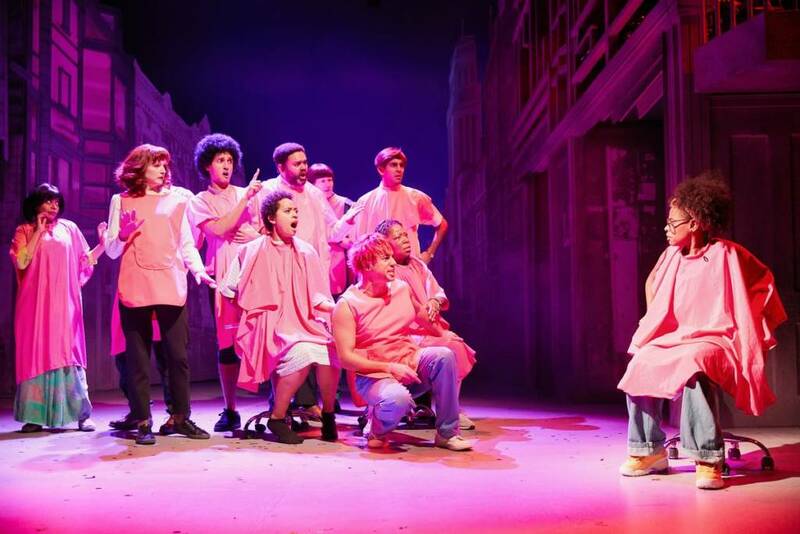 The production is superbly staged: from the first painted perspectival view of the High Road to the knockabout ending – this is full of noise, colour and verve. A celebration of being alive, and of the area and its surroundings in a multitude of senses. It has to be bold. This is a British story, but it is not a restrained, “stiff upper lip” type of story where crumbled biscuits might mean sexual misdemeanours. Smith tells it as she makes it up, brashly and warts-and-all. For those who do not know the novel and abjuring spoilers: two friends Archie (Richard Lumsden) and Samad (Tony Jayawardena) – a working-class Londoner and a Bengali Muslim – who meet in the army in the final days of World War Two and then continue their friendship in NW London, the unwinding serpentine story of their families and the liberal Jewish middle-class Chalfens, give us the younger protagonists: Archie’s daughter Rosie (Amanda Wilkin) and Samad’s sons Magid (Sid Sagar) and Millat (Assad Zaman). Add to these a chorus of Dickensian minor characters. Put them in a world where cultures are colliding and conniving, throw in some bungling Islamist and animal rights terrorists (KEVIN and FATE) and a genetically designed FutureMouse and you have a spicy hot-pot of stories from which to dip and savour. Working together as an ensemble the cast keep the high-tempo production moving at a spanking pace. Difficult to pick stand-outs, it isn’t that kind of play. All the cast are protagonists with either a major role or doubling and trebling up in smaller but vital parts, making them all indispensable. Big shout out to the musical team too who keep the flow with incidental music which punctuates and comments on scenes and step up in the musical numbers. A little bit like the novel, the play zips along throwing all sorts of unlikely story-lines and coincidences into the mix. Is this magical realism or, in the phrase coined by a detractor James Wood, “hysterical realism”. Take your pick. The blunt fact is that many modern novels, including the aforementioned genre, are rather less modern than they might appear and take their inspiration from ancient sagas and as much as from the modern “canon”. “White Teeth” is even self-referential within the genre, using the violent protests against Salman Rushdie’s “The Satanic Verses”. Directed by Indhu Rubasingham, this is a joy to watch and you get a real sense of localism, even in the knowing self-recognising nods and laughs from the audience, seldom to be had on the London theatre scene. Suspend your disbelief and rejoice, just rejoice.